The National Museum of Natural History in Washington, D.C displays one of the largest faceted gem-quality blue sapphires in existence. Named the Logan Sapphire, this valuable 423 carat gem draws hundreds of visitors from across the world. Our Sapphire Walnut Plaque may not be visited by tourists, but it is sure to be priceless to the lucky recipient. 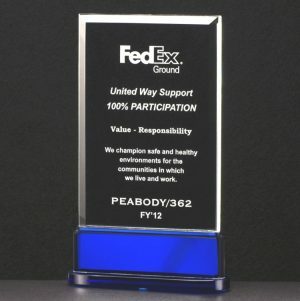 This wonderful plaque makes the perfect award to say congratulations or thank you to any hard working associate, colleague, or employee. Offered in three sizes (P4200 = 7″ x 9″, P4201 = 8″ x 10.5″, and P4202 = 9″ x 12″), each size has a walnut stained mounting board and a splendid sapphire colored engraving plate with a gold tool line border. We can engrave corporate logos, mascots, artwork and up to eight lines of text on the plaque, and all engraving is free. The Logan Sapphire may be on display in a museum, but the recipients of our Sapphire Walnut Plaque will proudly display it for years in their homes and offices.